Click for a full-sized poster. Print it and display it! On the left is the poster for the 2018 Bluegrass Festival. We'll put the 2019 poster here on this page as soon as it's ready. Thanks for your help. You may also want to tell all your Facebook and other friends about the festival. 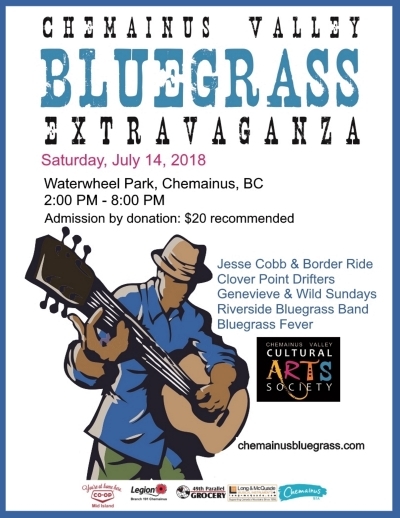 The more people who know about it, the better it is for Bluegrass and for the town of Chemainus. The poster is in PDF format. In the unlikely event that you don't have the PDF reader on your computer, you can get it here. We're really looking forward to this wonderful festival and we hope that you are, too. Please let everyone know about this great event (there's nothing like word-of-mouth) - thanks!